There are several ways to make a hatch pattern in Rhino. The first and easiest, if you own AutoCAD, is to import the ACAD.PAT into Rhino. Second, you may want to download them off the Internet from sites like DotSoft. You can also create an PAT file in Notepad from scratch using one of the tutorials below. 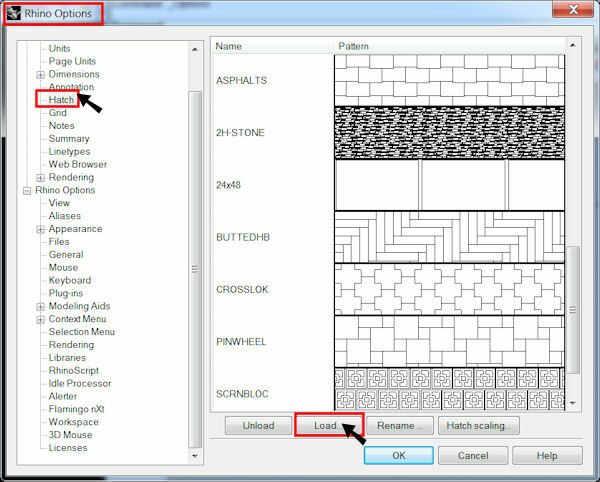 Since Rhino uses the same format as AutoCAD, any tutorial on creating an AutoCAD pattern will work. Download a sample Rhino hatch pattern file to use. Import this into your Rhino file in Rhino from: Options→ Document Properties → Hatch → Load.